I want to make a distinction between two types of spiritual friendship, which might be called the “horizontal type” and the “vertical type.” What I call horizontal spiritual friendship is friendship between people who are at roughly the same level in following the path; this is the friendship between “partners” in following the path, and what unites them as spiritual friends is a common dedication to following the Buddhist path. People come together and unite as friends for various reasons. We usually take the gregarious side of human nature for granted, but to understand the nature and importance of friendship it’s instructive to reflect on the factors that bring people together and unite them as friends. To do so will give us a standard for evaluating our own friendships and seeing which are helpful and which harmful. The Buddha says that it is because of an “element” that people come together and unite. What is meant by “element” here is the basic disposition or trait of character. Thus the Buddha says that those of inferior disposition come together and unite with those of inferior disposition, whereas those of superior disposition come together and unite. So, if we cast our mental eye out upon the world, we can see that on a given Saturday night many people will go out to night clubs to enjoy themselves dancing; others will go to bars to enjoy drinking and chatting together; others might go to sports matches; others will get together and watch crude films. That is what unites them in friendship. So this is how people of inferior disposition come together and unite. though we are walking through a desert. It can be very lonesome, the landscape around us is rough and barren, and we have no refreshment, no inspiration from others to replenish our energies. But when we unite with others in spiritual friendship based upon common aspirations, this reinforces our own energies. When we walk a common path and engage in common practices, we gain encouragement, strength, and inspiration to continue in our practice. This is like crossing the desert in a caravan: others help us carry the supplies, we can pause for conversation, we have a sense of sharing the trials along the way, and we rejoice together as we approach our destination. When we unite with others in spiritual friendship, this not only transforms our approach to the practice, but also has an impact upon the very nature of our friendships. In our worldly life, our friendships are very closely connected with personal attachments, which in turn are rooted in our own egocentric needs. Even when we think we love the other person, often we really love that person because this relationship in some way satisfies a deep need within ourselves. When the other person fails to satisfy this deep need within us, our feelings quickly become embittered and our love turns into resentment or even enmity. But when we enter into a spiritual friendship based upon dedication to a common goal, this friendship helps us to transform our attachments and ego-centered drives. Even more, it helps us to transcend the very idea of the ego-self as a substantive reality. Spiritual friendship, we discover, is not about satisfying my personal needs, or even about my satisfying the other person’s personal needs. It’s about each of us contributing as best we can to uplift each other, and to bring each other closer to the ideals of the Dharma. In spiritual friendship we are concerned with the other person not because of the ways that person satisfies us, but because we want to see the other person grow and develop in the direction of greater wisdom, greater virtue, greater understanding. We want the other person’s wholesome qualities to attain maturity and bring forth fruits for the benefit of others. This is the essence of “horizontal” spiritual friendship: a keen interest in helping our friends grow and develop in the practice of the Dharma, in maturing their potential for goodness, for understanding, for wholesomeness. Thus spiritual friendship is of two types, horizontal and vertical. Horizontal spiritual friendship, as I explained in the previous installment of this essay, is friendship between people who are at roughly the same level in following the path; that is, it is the friendship between companions on the path, and what unites them as spiritual friends is a common dedication to following the Buddhist path. The other aspect of spiritual friendship is what I call “vertical” friendship. This is the spiritual friendship between people who are at widely different levels on the path. We might also call this “asymmetrical” friendship, in that the relationship between the two members is not one of equality. This type of spiritual friendship is the bond between senior and junior followers on the path, especially the bond between a teacher and a student. Because the relationship between the two is not equal or symmetrical, if this relationship is to be mutually beneficial, different qualities are required of the teacher and the student. In a relationship that revolves around the Dharma, the ideal teacher should have wide knowledge of the Buddhist scriptures and also abundant practical experience in following the teaching. Few teachers measure up to the ideal in all respects, and thus most students must be ready to settle for teachers who, like themselves, are still far from perfect. But two essential qualities in a teacher are a clear understanding of the fundamental principles of the Dharma and a sincere dedication to the proper practice. Besides knowledge and practical experience, the teacher must be willing or eager to teach. This willingness or eagerness to teach, however, shouldn’t stem from personal ambition or egotism, from the desire to be an outstanding teacher surrounded by a flock of admiring disciples. Rather, the teacher should regard himself as a humble transmitter of the tradition, and his desire to teach should be motivated by compassion for his students and by a sincere wish to uplift the students by improving their knowledge and practical experience. The teacher should treat the students with kindness and gentleness when they are well disciplined and obedient; but though he should be kind and gentle, he should not treat his students too leniently but should know how to maintain the proper distance needed to preserve his own dignity as a teacher. And if he’s a true spiritual teacher and not just one who is imparting knowledge, he should be ready to discipline his students when necessary by admonishing them, pointing out their faults, and attempting to correct their faults. The student should adopt the proper attitude in relation to the teacher. In Buddhist spiritual training, the attitude required is quite different from that of a student at a university. The attitude required of a student is one directed toward spiritual understanding and realization. Whereas academic study can lead to success independently of the personal character of the student, in the study of the Dharma, success is directly proportional to the purification of one’s character. Thus at the outset students need the qualities conducive to spiritual growth. Students should have faith in the teacher, confidence that the teacher is a superior person able to help them, to guide them in their spiritual development. This, of course, is not a blind faith, but a trusting confidence in the spiritual capacities of the teacher. It is the trust that the teacher has invested a long period of time in his own spiritual training and thus is sufficiently qualified to guide the student at least a few steps further in the practice of the Dharma. Both teacher and student are united in a common faith, faith in the Triple Gem, faith in the efficacy of the Dharma as a path to liberation and to the realization of the ultimate good. But students should assume that the teacher, by reason of his role, has a faith that is deeper and more solidly grounded than their own and thus that the teacher’s advice and guidance should be accepted as worthy of trust. This does not mean that the student must regard the teacher as infallible and accept every bit of advice that the teacher offers, nor does it mean that the student must docilely follow every order that the teacher issues. 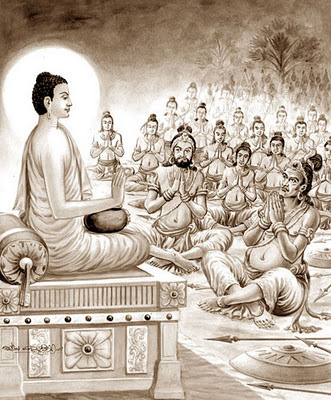 The Buddha respected the capacity of mature human beings to make independent judgments; he did not subscribe to the view held by many Indian religious teachers that disciples must regard their teacher’s word as absolute law. In the Vinaya, the Buddhist code of monastic discipline, pupils are authorized to correct their teachers if they see them engaging in improper modes of conduct or hear them advancing wrong interpretations of the teaching. This principle, laid down over two thousand years ago, is still valid today and should regulate the relationship between teachers and their students. But to allow students to evaluate their teachers’ ideas and conduct does not mean that the students are entitled to act without respect. To the contrary, one can only advance in the Dharma if one is respectful and reverential towards one’s teachers. One should never be obstinate, proud, or arrogant towards anyone, least of all towards the person one regards as one’s guide to the understanding and practice of the Dharma. The practice of the Dharma aims at subduing the ego, the false sense of self, and to act in ways that inflate the sense of self is to defeat one’s very purpose in following the Dharma. The relationship between student and teacher provides an ideal field for both to work at tackling the importunate demands of the ego. The student gains this opportunity by developing a respectful attitude towards the teacher and by showing respect in bodily and verbal conduct: for example, by standing up when the teacher enters the room, by making anjali towards him, by speaking to him politely and with a humble demeanor. The teacher also can use the relationship to subdue his own ego: by refusing to adopt an arrogant attitude towards the pupil, by treating the pupil with kindness and consideration, by sharing his knowledge with the pupil. One quality that the Buddha considered essential in a qualified student is called (in Pali) suvaco, which means being “easy to speak to.” A student who is “easy to speak to” is ready to listen to his or her teacher and to accept the teacher’s advice without resentment, without vindictiveness, without arguing back, without complaints. Spiritual growth in the Dharma is a process of abandoning one’s faults and replacing them with the opposing virtues. Yet too often we are blind to our own faults, unable or unwilling to see them. A skillful teacher is like a mirror: he shows us our faults clearly, insistently, without deception, reminding us of the faults we continually strive to hide from ourselves. For it is only when we are willing to see our faults that we can correct them. If we go on denying these faults, insisting that we are perfect, then we will continue to wallow in them, like a buffalo in the mud. But when we open up to the teacher and show a willingness to see our own faults, to subdue our self-will, we then take the first major step in the direction of correcting them. It is through this consistent, continuous process of removing our faults, of subduing our egocentric tendencies, that we move in the direction that the Buddha is pointing us, the direction taken by all the noble ones of the past. It is in this way that we can collect the precious jewels of the noble virtues and embed them in our own hearts and minds, so that we shine resplendent in the world. For this reason, the Dhammapada says that when the teacher points out a student’s faults and tries to correct them, the student should feel as though the teacher were pointing out hidden treasure.